As an admin team we will be spending time with Michael Fullan next week. In preparation, we have been doing some reading, watching videos, and having discussions about his book, ‘Coherence’. I will be blogging more about the time we get to spend with him, but I thought I would put a few short thoughts down ahead of time. It’s also been a long time since I’ve written a blog, so I better get something down! At my school, we’ve been doing quite a few things that align with Fullan’s ideas, especially around the collaborative cultures. We have put effort into deepening learning, especially around setting goals and capacity building. I would say the areas that we need to have more coherence around are Accountability, and turning I minds toward Clarity of Strategy. We do have accountability, and need to be careful to ensure tha there is both external and internal accountability. We have come a long way in the last few years in understanding the importance of internal accountability as a driver for change. In my mind, the internal accountability ties into the individual passion and is necessary for powerful change to occur. I look forward to deepening my understanding in this area as we spend time learning from Michael Fullan, and from each other. Our teachers’ convention is happening this Thursday and Friday. I love this event every year. I consider it an opportunity to break from routine. It’s an opportunity to learn and connect. It’s a time to think about new ideas and hopefully become refreshed. I get a little dismayed every year by the small group that just complains about the lack of sessions available to them. There are hundreds of sessions being offered, and if you can’t find something for you, I think it’s a different problem. It’s a problem of not wanting to explore new ways of thinking. Convention is a great learning opportunity. Lifelong learners need to be willing to step out there and take risks. They need to be open to hearing ideas that they don’t have to necessarily embrace, but can at least consider. I’m ready to get my Convention on! If there is one thing I have learned in my PLC journey over the past decade, it’s that I never want my school community to be limited by my skills and knowledge. I am just starting my PGP meetings with teachers today. Every year I try to do a better job of helping make the PGPs the teachers complete living documents that will help them in their journey. I talk about PGPs quite a bit, and it comes up every time we talk about our PLCs. Our PLCs are based on the goals that come up in the PGPs. Teachers are given time to discuss their goals as a group ahead of time, and this has resulted in a lot of alignment between teachers. This year, more than ever. We are also talking about the things we accept as evidence of student learning. Teachers have been asked to be mindful of this as they crafted their PGPs and as they work together in their PLCs. 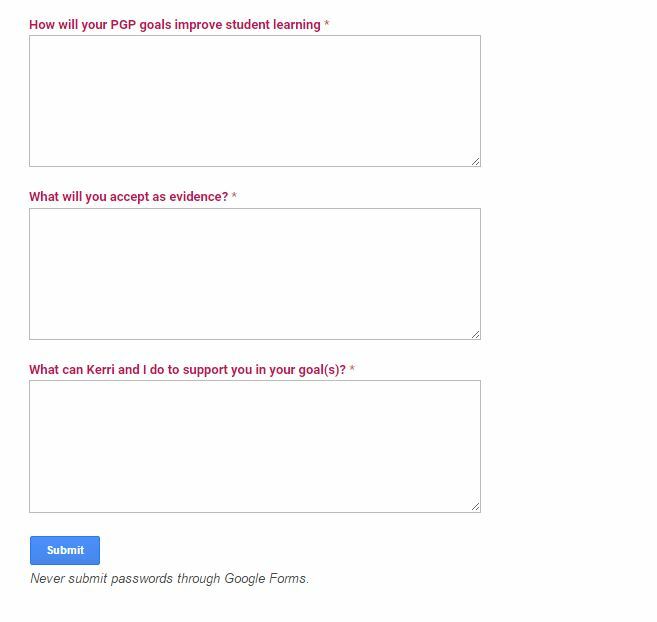 As I have been thinking about maximizing the PGP meetings, I decided to use a Google form that I would complete during the meetings to gather evidence for myself that these things were addressed. I have narrowed the meeting down to only three questions. The Form provides opportunity for me to select each teacher and then fill in the appropriate information for each question. It’s quite simple, but I think the questions are the important ones. I’ve emailed the teachers the three questions ahead of time so they are ready for them when they come into the meeting. This is a screenshot of the questions in the form. As we focus on evidence of student learning, I’m focusing on gathering evidence of teachers gathering evidence. So, students returned to school on August 31st. We are well into the routine once again. It is amazing how quickly you get the feeling that you never left. The routine is good, but sometimes the nonroutine is just what you need! The school year has started very smoothly. No big glitches, no bumps or scrapes, and everyone seemed to settle in quite quickly. Hopefully that continues! What do we accept as evidence of student learning? We’ve made a lot of progress in the area of teacher led PLCs and PD. But how do we KNOW that what we are doing makes a difference in student learning? The discussions are just starting, but I look forward to where they’ll lead.